The Homestead at Surf Beach was the first house to be built in the area and has been seducing guests with it's unique charms since 1999. This large, historic house has been fully renovated, extended and landscaped throughout to bring you a classic mix of old charm with modern conveniences. The house is set on three quarters of an acre close to the beach giving guests a feeling of space. It has six bedrooms, polished baltic pine and hardwood floors throughout, 2 bathrooms, 4 living areas, extensive new kitchen and a large full length covered verandah. The kitchen is expansive and fully equipped with a 5 burner gas stove, large electric oven, microwave, double sink, 2 fridges, new dishwasher, coffee maker, every utensil under the sun and more then enough plates and cutlery for a large group. There is also a breakfast bar at one end of the long counter. Outside there is a massive garden room/pergola. Inside is a 6 burner hooded bbq, fridge, lounge area, 5 metre dining table and dinner settings for 16 people. At the front of the house is a huge covered and enclosed verandah that runs the length of the house. 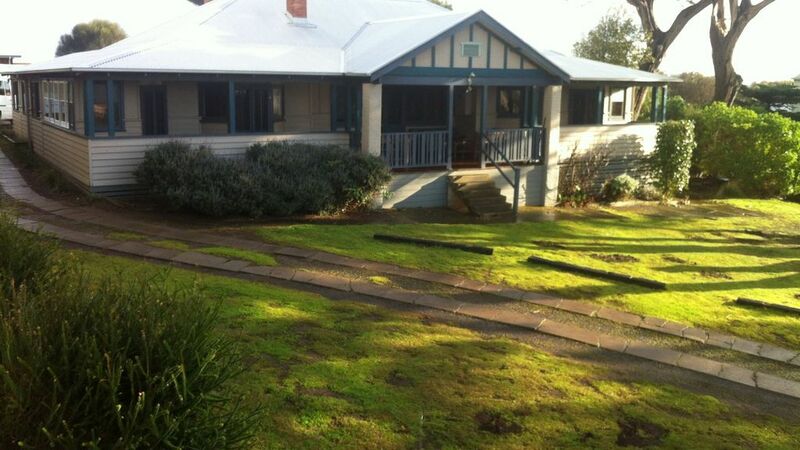 Four of the bedrooms and the front lounge room have opening double doors onto this verandah. There is a long dining table for el fresco dinning and spectacular views to Bass Strait and Westernport Bay. The space is so large that there is also several lounge suites to socialise and relax on. Sensational Surf Beach is a 100 metres down the road. Here you can walk 6 kilometres to Cape Woolamai in one direction and 2 kilometres to Sunderland bay in the other. The beach has a mixture of sandy areas, rocky out crops and surf at the point. There is a large fire place (with an abundant supply of wood) in the back lounge room making it perfect for cool winter nights or even just for ambiance at other times. The front lounge room has a gas heater and all the bedrooms have electric heaters in them. There are electric blankets on all queen and double beds and a few single beds as well. One of the features that guests love, and continually comment upon, is the outside shower stall. Of course it has hot water and a shabby chic construction surrounded by ever green shrubs and plants. Not only perfect for the post swim rinse down, it can be enjoyed anytime of the day. There is ample parking for cars at the front and rear of the property. Plenty of room for a trailer as well! The house is 150 metres from the Surf Beach "bottle-o" which sells your daily needs such as papers, milk, bread, general bits and bobs as well as alcohol. There is a bus stop here as well with buses to Cowes, San Remo, Melbourne and stops in between. For weekend bookings, guests may arrive anytime Friday and depart anytime Sunday if the house doesn't have back to back bookings. The house is situated at the narrowest point of Phillip Island, on the top of the hill at Surf Beach. This position creates views to the North of Swan Bay and Westernport Bay. Views to the East and South of Cape Woolamai, Bass Strait and Pyramid Rock. Everyone who has been to this house, loves it!! It is character personified. It is close to a wonderful beach. It has space. It has everything that you could possibly need for a perfect holiday. I am positive you would enjoy your stay at the magical Homestead at Surf Beach. *NEW* Wifi available throughout the house. Classy, comfy and full of character! $ days with a gruop of riders and all enjoyed, the house, location and facilities. Great value and a really good feel. We loved our girls weekend away. Every thing we needed and more. Comfy beds, open fire, plenty of room for everyone in a lovely homey house. The house had a great vibe and welcomed us in. Were all definitely wanting to go back in the warmer months. So close to the beach and the bottle shop on the corner. plus the rabbits running around the front yard on dusk. Simon was easy to communicate with and had everything there ready to go. Heaps of room, very clean, very comfortable and has great charm. We are return guests to the Homestead and love it. The property comfortably fitted 16 of us and the property had everything we needed and more. Clean and fresh and the location is fantastic. Wonderful homestead for our family getaway. Clean & comfortable, bedrooms galore, well appointed large kitchen to keep any cook happy. Vast gardens had the kids exploring for hours, whilst the adults relaxed on the verandah. 200m walk to a gorgeous beach, perfect for a swim or surf Loved the outdoor shower too. Gorgeous, character filled home. Loved it, hopefully we'll be back at some point! Thanks Simon.